Magic is dangerous or it is nothing. This statement, from William S. Burroughs' introduction to Between Spaces, offers perhaps the best summation of the magickal philosophy of Templum Nigri Solis (TNS) - one of the most influential and notorious temples to work within the Chaos Current. For nearly thirty years it has pioneered new and revolutionary techniques for liberation of the spirit and charting the farthest reaches of Magickal experience. Available for the first time this long sought-after collection of papers offers the reader the tools to work powerful Magick and effect a radical tranformation of the psyche. In this book you will find the power to open gateways to infinite possibilities. Although it contains a wealth of practical material, Between Spaces is not a "How To" manual or a rehashing of previously published information. The essays and rituals found inside are based on personal experience and draw on a wide variety of traditions, including; Ceremonial Magic, Witchcraft, Shamanism and Tantra. These papers strip Magick of its Holy Games to reveal the freedom which is to be found in the direct experience of Chaos Itself. 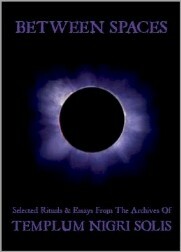 This collection represents the most important volume to be published on Chaos Magick since Liber Null. © Copyright 1988, 2008 T. Harris and Templum Nigri Solis. Illustrations © 2008 T. Harris and Soror Kauket.